Pragmatism: An Introduction provides an account of the arguments of the central figures of the most important philosophical tradition in the American history of ideas, pragmatism. This wide-ranging and accessible study explores the work of the classical pragmatists Charles Sanders Peirce, William James and John Dewey, as well as more recent philosophers including Richard Rorty, Richard J. Bernstein, Cheryl Misak, and Robert B. Brandom. Michael Bacon examines how pragmatists argue for the importance of connecting philosophy to practice. In so doing, they set themselves in opposition to many of the presumptions that have dominated philosophy since Descartes. The book demonstrates how pragmatists reject the Cartesian spectator theory of knowledge, in which the mind is viewed as seeking accurately to represent items in the world, and replace it with an understanding of truth and knowledge in terms of the roles they play within our social practices. The book explores the diverse range of positions that have engendered marked and sometimes acrimonious disputes amongst pragmatists. Bacon identifies the themes underlying these differences, revealing a greater commonality than many commentators have recognized. The result is an illuminating narrative of a rich philosophical movement that will be of interest to students in philosophy, political theory, and the history of ideas. Michael Bacon is a lecturer in political theory at Royal Holloway, University of London. He is the author of Richard Rorty: Pragmatism and Political Liberalism. "For once, the endorsements on the cover of a book are not exaggerated. As an excellent introduction to an important strand in philosophy, this book deserves to be available in every library that caters to students of phiosophy and perhaps even those that cater to interested laypeople." "Most certainly a helpful introductory text for newcomers that ought to be required reading for the rest of us in the midst of our own heated debates." "A concise, reliable and lucid overview." "This book offers an engaging and engrossing introduction to and overview of a rich philosophical tradition. Particularly valuable is its survey of a variety of recent and contemporary developments by thinkers who build on and carry forward that tradition." "Brings together classical and contemporary pragmatists in a very clear, succinct, and rigorous way." pragmatist tradition, and an excellent introduction to the topic." This is a comprehensive and contemporary introduction to the key figures and ideas which have defined the influential American philosophical tradition of Pragmatism. Ranges from classical pragmatists such as Dewey, Peirce and James, through to the more recent contributions of Rorty, Bernstein and Brandom. 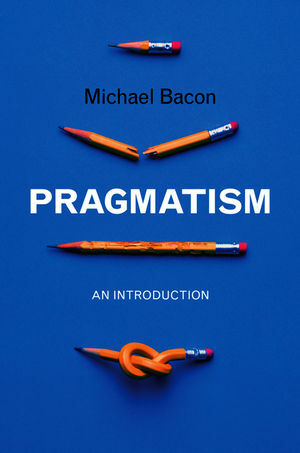 Michael Bacon expertly illustrates how Pragmatism represents a break with some of philosophy's most unquestioned presuppositions. This is an accessible and exciting narrative account which will be of interest to students and scholars in philosophy, politics and the history of ideas.